Wet felting is a great way to create a soft and dense fabric out of woolen knits, crochet, or woven projects. The felted material is durable and great for slippers, bags, and more. Felting is an ancient craft that is still popular today. The felting process transforms wool into a dense cloth by bonding and shrinking the fibers together. And although there are three types of felting: wet felting, needle felting, and commercial felting, this tutorial focuses on wet felting. With wet felting, you can create a soft, dense cloth using wool. The process uses heat, agitation, and moisture to shrink and bond the fibers of the wool together. Don't let this description scare you away from trying wet felting–all you need is some yarn and a washing machine! Yarn manufacturers often label their yarn when it is suitable for felting. If the yarn package is not labeled for felting, look for 100% wool yarns. If you are following a specific pattern, use that as a guide as to what brand/kind of yarn to buy. Different brands and types will felt differently. Also, when making a project, use only one brand of yarn, even if you are using different colors. Rather than creating your own item using yarn and then felting it, you can also use an old wool sweater. In fact, many people have accidentally learned this technique when placing a sweater in the wash! If the project you find comes with felting directions, follow them closely. One of the nice things about working directly from a felting pattern is that all the steps should be tested, so your finished project will turn out how it is supposed to. 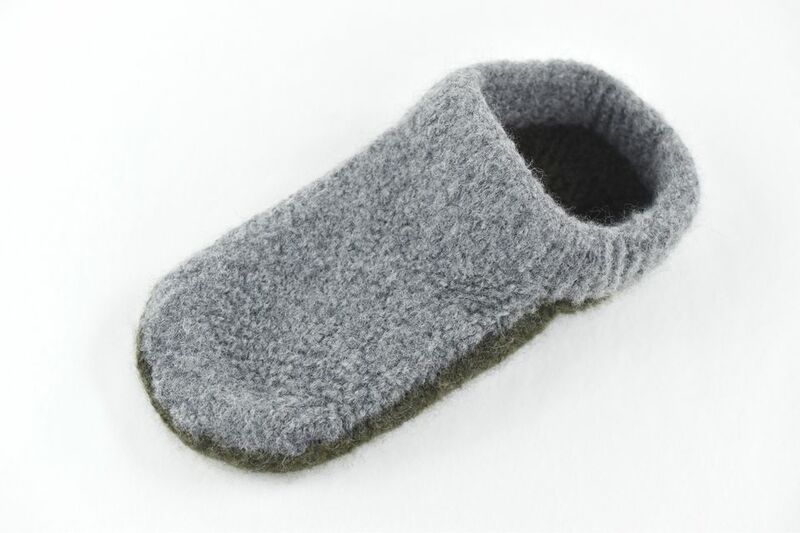 The slipper in this post was made using the Felted Clogs Made Easy pattern. If you find a pattern you like that was not created especially for felting, you can usually adjust it to work for felting. During the felting process, you can expect to lose around 25% of the size of the finished pattern. There is also often a difference between how much height and width you will lose. The best way to prevent felting surprises is to test the yarn for shrinkage first. To do this, create a swatch, knitting or crocheting a square measuring about 4" x 4". Run that square through the felting process to see what kind of results you get. Using those results, adjust your pattern as desired. While it's possible to felt wool projects by hand, the process is easier, quicker, and even safer if you use a washing machine. Place your item in a pillowcase and tie or zip it shut. If you're creating more than one felted piece, you may want to place each one in its own pillowcase. When those items need to match, such as with a pair of slippers, you should felt both at the same time so they felt equally. Put the pillowcase in your washing machine. You can also add a pair of jeans to create more agitation if you want. Add a few drops of detergent to your washing machine. Set it to run on a short cycle with hot water. Check the item to see how it's felting. If you want it to felt more, place it back in the hot water and reset the wash cycle so it continues to agitate. Continue to check it about every 5 to 10 minutes until it is the desired size. It could take several checks before your item is done. The photo above shows how the slipper looked after one cycle in a front-loading washer. Once you determine it is done, simply let the washing machine finish running it through the rinse and spin cycles. If you prefer, you can remove your piece and hand rinse it in cold water and gently ring it out and pat it with a towel. To dry your felting project, lay a clean, dry towel down on a hard surface. Lay the project down flat on top of the towel. Make sure it is away from bright sunlight and any direct heat. Do not put it in the dryer. While your piece is wet, take some time to stretch and manipulate it into shape. Depending on the item, you can hold it in place by covering it with a second clean, dry towel and then setting heavy objects on top of it. Make sure you check your piece often though to make sure it is drying okay. Turn the piece over occasionally to keep air circulating around it, speeding up the drying process. Typically it takes a couple days to dry. The before and after shows the shrinkage, as well as how the knit stitches blend together. Once your felting project is dry, it is done, but you may need to clean it up a little bit by trimming off any pilling or longer fibers that were caused by the felting process. Simply use sharp scissors to trim off any blemishes. If you felted an old wool sweater, you can cut through the felted material and sew with the newly made felt.